Chinese orbital launch vehicle. 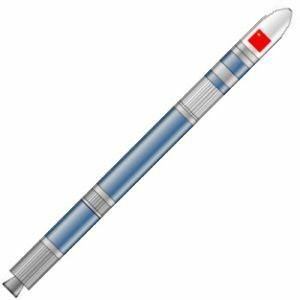 The Long March New Generation Launch Vehicle series small launcher would use the 2.25 m diameter module as the first stage and a single upper stage of the same diameter. Payload was given as 1.5 metric tons into low earth orbit. First launch was expected after 2008. Although the configuration was not shown at the Wuzhai Air Show in 2002 it re-emerged at the FAI in 2003. It seemed to be in competition with the all-solid-propellant KT-1, KT-2, and KT-2A series. Version dropped together with the 2.25 m booster module and replaced with the CZ-6, which combined a shortened 3.35 m booster module and the 2.25 m diameter upper stage. 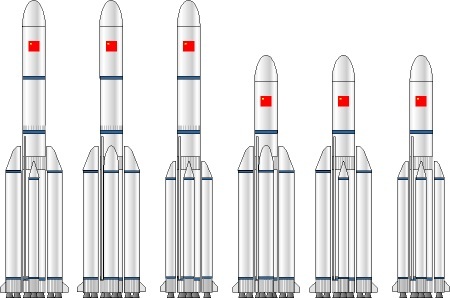 AKA: Chang Zheng-5-2.25;CZ-5-2.25;CZ-NGLV-Light;Long March Next Generation Light Launch Vehicle. Status: In development. Payload: 1,500 kg (3,300 lb). Thrust: 1,200.00 kN (269,700 lbf). Gross mass: 82,000 kg (180,000 lb). Height: 33.00 m (108.00 ft). Diameter: 2.25 m (7.38 ft). Span: 2.25 m (7.38 ft). Apogee: 300 km (180 mi). LEO Payload: 1,500 kg (3,300 lb) to a 300 km orbit at 42.00 degrees. Stage 1. 1 x CZ-NGLV-200. Gross Mass: 69,000 kg (152,000 lb). Empty Mass: 6,000 kg (13,200 lb). Thrust (vac): 1,340.170 kN (301,282 lbf). Isp: 336 sec. Burn time: 150 sec. Isp(sl): 301 sec. Diameter: 2.25 m (7.38 ft). Span: 4.60 m (15.00 ft). Length: 25.00 m (82.00 ft). Propellants: Lox/Kerosene. No Engines: 1. Engine: YF-120t. Status: Development 2004. 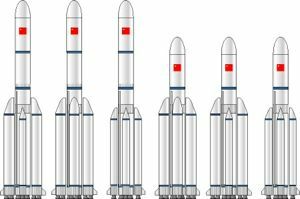 From top to bottom the 2.25-m Chinese new generation launch vehicle consists of a 42.3 cubic meter liquid oxygen tank, an intertank section, a 22.0 cubic meter kerosene tank, and an engine section with one gimbaled LOX /Kerosene engines of 1200 kN vacuum thrust. The oxygen tank is pressurized using oxygen bled from the engine and helium is used to pressurize the kerosene tank. The engines can be throttled to 65% of rated thrust. Burn time shown assumes full thrust during engine burn. Stage 2. 1 x CZ-3-3. Gross Mass: 10,500 kg (23,100 lb). Empty Mass: 2,000 kg (4,400 lb). Thrust (vac): 44.100 kN (9,914 lbf). Isp: 425 sec. Burn time: 800 sec. Diameter: 2.25 m (7.38 ft). Span: 2.25 m (7.38 ft). Length: 7.48 m (24.54 ft). Propellants: Lox/LH2. No Engines: 4. Engine: YF-73. Other designations: H-8. Status: In Production. CZ-NGLV-200 stage LOx/Kerosene propellant rocket stage. From top to bottom the 2.25-m Chinese new generation launch vehicle consists of a 42.3 cubic meter liquid oxygen tank, an intertank section, a 22.0 cubic meter kerosene tank, and an engine section with one gimbaled LOX /Kerosene engines of 1200 kN vacuum thrust. The oxygen tank is pressurized using oxygen bled from the engine and helium is used to pressurize the kerosene tank. The engines can be throttled to 65% of rated thrust. Burn time shown assumes full thrust during engine burn. Family: orbital launch vehicle. Country: China. Stages: CZ-YF-73, CZ-NGLV-200 stage. Agency: CALT.